Have you ever heard the song Everyday Is a Winding Road by Sheryl Crow? Well those cool drumbeats are made using bongos or bongo drums. Bongos are used in all sorts of music but especially in world music which uses tons of percussion instruments. An example of world music is The Gipsy Kings. Ricky Martin uses bongos in his music all the time. They were extremely popular in those cha-cha songs from the 60s but have been around since the late 1800s. Cuba is famous for bongos but they may actually have originated in Africa. 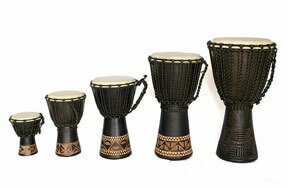 Bongos are two small open-ended drums that are joined together. Each drum is a different size so you can produce different notes with each side. The most common drumheads are made of animal skins, but they're also available in thin plastic. The body of the drum is usually wood, metal or even ceramic. A simple pair of bongos doesn't have a drumhead that can be stretched and tuned to produce different notes. Fancier ones do have adjustable heads which are fastened and tightened with metal bars. Better quality drums can fit on drum stands for easier play. Musicians playing live gigs usually play with the help of a stand. By using your thumbs, fingertips and the heels of your hands, you can produce different notes by striking the head. It's important to protect the head of your drum with special "drum oils." If you don't the air and your hands can absorb the moisture of the drum skin and it can become dry and crack. The great thing about bongo drums is that they're very portable, cheap and fun. This is one reason why they are popular as classroom percussion instruments.. If you know any other people who play any kind of hand drum it's really cool to get a drum circle going. That's when you get a group of people together and everyone goes off on their own little groove and it sounds amazing together. If you're just starting out, it may not sound so amazing at first but give it time and it's a trip. People often have drum circles on the beach while people dance in the sand in the middle of the circle. So pick up a hand drum and an instruction CD and play that funky music.